Dharma Yoga has roots in all nine forms of yoga, including Hatha, Raja, Karma, Kriya, Bhakti, Japa, Laya and Jnana, as well as a focus on the Eight Limbs of Yoga (Patanjali’s Ashtanga Yoga) with great emphasis placed on Yama and Niyama. Sri Dharma was given an extraordinary gift of knowledge in receiving yoga directly from his Guru, Sri Swami Kailashananda a.k.a. Yogi Gupta, for over a decade beginning in the early 1960′s. During this period of intense study, Sri Dharma was exposed to various yoga techniques that he has refined over an almost half century of practice and teaching into the Dharma Yoga he and his certified teachers the world over continue to share with their students each day. In essence, Dharma Yoga is a system of classical Hatha-Raja Yoga. A devotional practice that emphasizes good health, a clear mind and a kind heart. The method weaves together many teachings in order to bring all students closer to the goal of Self-realization. "When you spend time in a pose, it begins to whisper its secrets." "The attention is a strong magnet for the Prana." "Every time you have a chance, go within and do your meditation." Dharma yoga Zagreb is founded in 2011 Sandra P. Pintaric, the first teacher in Croatia and in this region of Europe. Since then she has been serving Dharma Mittra Yoga through her yoga center in Zagreb and traveling all over Croatia and neighboring countries. She travelled to New York City to continue her advanced education as a Yoga Teacher with legendary Yoga Master, Sri Dharma Mittra. Highly impressed by Dharma Mittra, a true yogi, and his teaching skills, she chose him as her Master Teacher of Hatha-Raja Yoga. She dedicated herself to spreading the Dharma yoga in Croatia and neighboring countries. Today, there's a lot of practitioners and teachers who have recognised the values of the teachings of the Sri Dharma Mittre and contribute to the expansion of the Dharma Yoga. 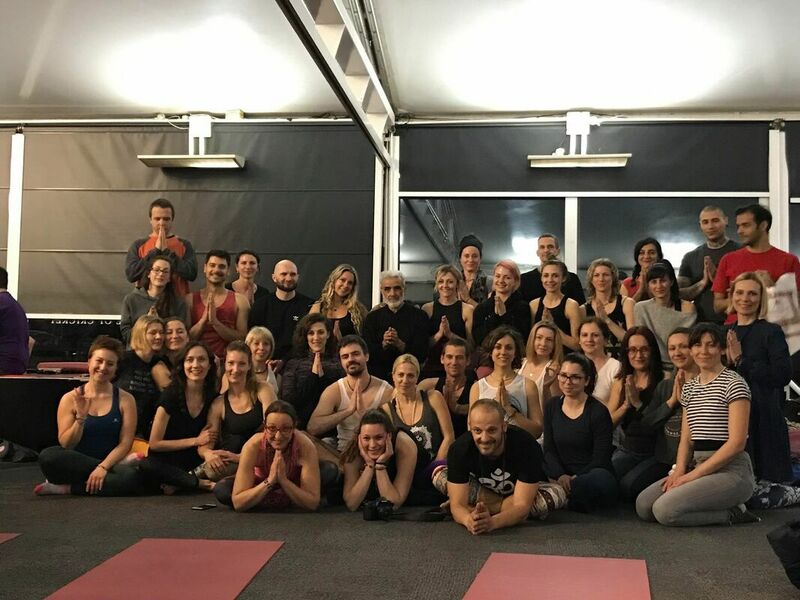 All of our teachers have completed advanced training with teacher Sri Dharma Mittra in the New York Center "Life of a Yogi" and many others have visited the legendary teacher in New York or London. ​Below are descriptions for all Dharma Yoga classes and workshops to help you decide which ones are suitable for you. Every class is available to all students, but it is suggested that you choose the level that is most appropriate for you, so as to receive the maximum benefit. DHARMA YOGA SHIVA NAMASKAR VINYASAS are challenging and physically absorbing vinyasa series created by Sri Dharma Mittra. They reintegrate the flow of prana throughout the spinal column and facilitate the movement of the vital life force deep into all areas of the physical, metabolic, intuitive and bliss bodies. This promotes harmony within all these layers so a concentrated state of radiant health is achieved. The highest crowning meditative asanas,pranayamas (breathing techniques), and Yoga Nidra (psychic sleep), which are embedded in the deep roots of Sri Dharma Mittra's teachings, are also imparted to the students. Gaining spiritual knowledge allows one to realize their full potential. This knowledge has the power to purify the body of toxins and calm the mind, leading to a state of optimum health, general well-being and self-empowerment. Sitting breathing and meditation techniques bring cumulative benefits. Chairs are provided, no previous experience needed. Psychic Development Techniques is a special series of mental exercises sequenced to improve your psychic abilities and promote the projection of your thoughts. They include specific breathing exercises, directed visualizations, and these two powerful mantras: the Mantra for Purification and the Mantra for Unification. These mantras will establish perfect psychic rhythm to mental patterns which puts power behind your thoughts making it easier to achieve your goals and desires in life. These ancient techniques have only been passed down by word of mouth from teacher to disciple and continue to be taught in this way. This class culminates in a final meditation to make your personal dreams a reality. Kirtan Devotional chanting. Bhakti Yoga is the yoga of devotion to the True Inner Self. Calling for or chanting the names of the Divine is considered the simplest method to find peace. Master Yogi Sri Dharma Mittra has spent most of his life in service to humanity, disseminating the ancient knowledge of how to achieve radiant health and spiritual development. He was born in the late 1930's and has studied Yoga since 1958. After meeting his guru (teacher), Sri Swami Kailashananda, he immersed himself in intense study and practice of the classical eight limbs of Yoga and nine years of dedicated full time practice of Karma Yoga. Sri Swami Kailashananda is known as the first Guru to bring the practice of Hatha Yoga to the west in the early 1950’s. Sri Dharma was accepted and initiated as a sannyasi (one who renounces the world in order to realize God). During these years he had the esteemed honor of being the personal assistant to the Guru attending to all his needs. Dharma Mittra spent many years as a full-time yogi and brahmachari (celibate religious student who lives with his teacher and devotes himself to the practice of spiritual disciplines). He then began teaching, only for his Guru and with selfless expectation. He was the main demonstrator for the Yoga asanas at the many lectures the Guru gave to the public in the '60’s and '70’s. After many years as a celebrated teacher at his guru’s Ashram, Sri Dharma left in 1974 to found the Yoga Asana Center, currently known as Dharma Yoga New York Center. Sri Dharma was one of the first independent Yoga teachers on the East Coast, initiating hundreds of thousands on the path of Yogic practice and teaching. 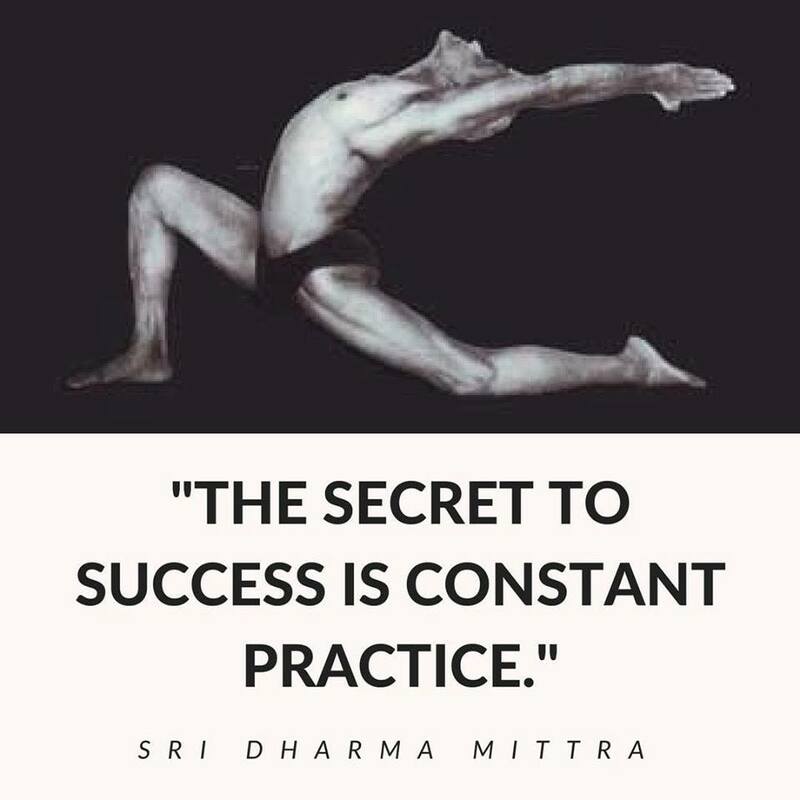 Dharma Mittra began disseminating this knowledge before "styles" of Yoga became popular, and has remained truthful to the original classical practice. Students from all walks and styles of Yoga love his teachings. Sri Dharma has literally been teaching classes continuously every day since he started in 1967. To this day he still makes himself available regularly to anyone who walks through the doors of the Dharma Yoga Centers in need of help and direction. He is known as "the Rock of Yoga" due to his dedication and fortitude, and also as the "Teacher's Teacher" for his experience and knowledge. Sri Dharma continues to inspire, enlighten, and reveal the real meaning of Yoga to Yoga teachers and practitioners daily. Sri Dharma writes: "It is my greatest joy to share with students this knowledge that I have acquired in the past 50 years of practice and study. Dharma Yoga practice will give one’s body the power and strength to have resistance to common illnesses and diseases. With proper encouragement and increased faith in the Guru, as one can improve his physical body and mental attitude rapidly, thereby igniting the higher motives of making one's self useful to himself and all mankind." Sri Dharma is a most beloved Yoga Master, known for his humility, humor, joy and kindness in teaching. Every student who comes to his practices is treated "as part of his family." He diligently teaches the Yamas, the first step of Yoga, as he sets the greatest example for it in his life. In every class you will hear "without the Yama’s, known as the ethical rules, there is no success in Yoga." He tirelessly promotes ahimsa (nonharming) through vegetarianism, veganism, a live food Yoga diet, and kindness to all living beings, especially our inferior brothers in the animal kingdom.